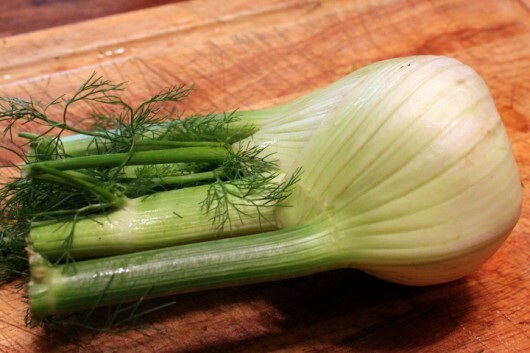 First, remove the stems and fronds from the fennel bulb (you can compost these, or save them for fish stock). Then chop up the bulb. 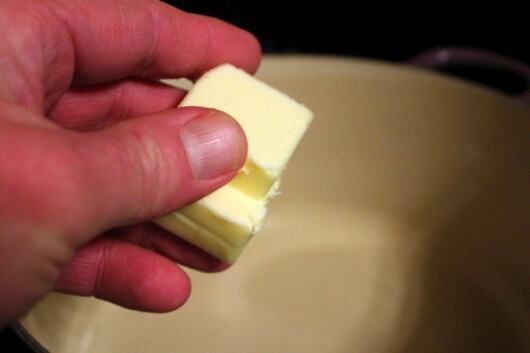 Heat the butter and olive oil in a large, heavy-bottomed pot. I used my 5-quart Le Creuset pot for this risotto. 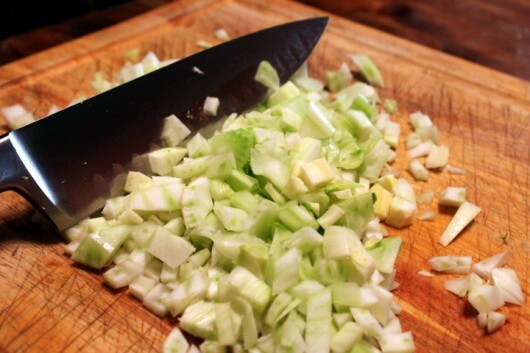 Pour the chopped fennel and leeks into the pot, and then stir them around until they soften — about 7 minutes. And stir it around to insure that every grain becomes coated with olive oil and butter — about 3 minutes. Pour in the Pinot Grigio, and stir and stir until the wine is absorbed by the rice — about 5 minutes. While you’re at it, pour yourself a glass of Pinot Grigio. You deserve it. Add the simmering chicken stock or vegetable broth, one or two ladles at a time, while stirring constantly. Wait until the rice absorbs the liquid before adding more. This entire step takes about 25 minutes. And by the way, stirring a pot is excellent exercise. You won’t have to visit the gym on risotto-making day. And the lemon juice. 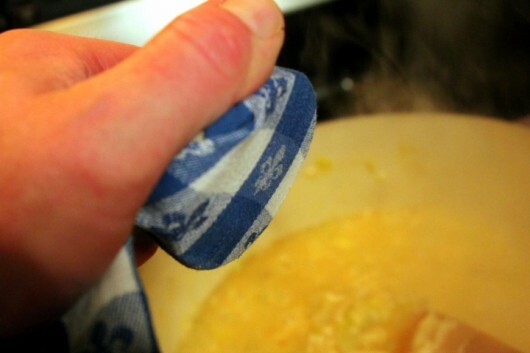 I like to squeeze the lemon through my beloved blue and white tea-towel. The towel keeps seeds from falling into the pot. Off heat, stir in the cream cheese until it melts. It should coat every ingredient in the pot. Okay, I know what you’re thinking. “This dish sounds fattening.” And you’re right. But remember — we burned off all those fat calories while stirring the pot. So you can enjoy this risotto without the slightest bit of guilt. And that is the gospel-truth, according to no one else but me. 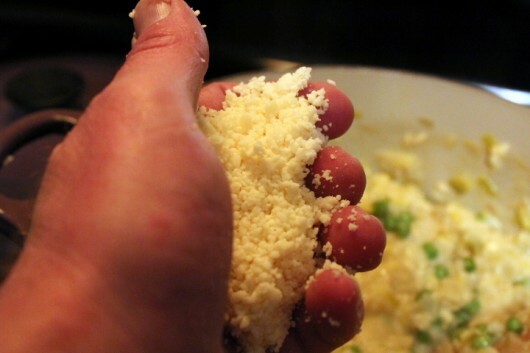 Stir in the Parmesan or Romano cheese. Also, stir in a pinch of salt and several grinds of black pepper. 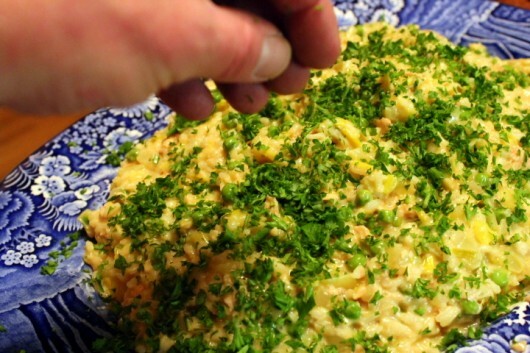 Pour the risotto onto your prettiest serving platter, and give it a generous sprinkling of minced, fresh parsley. You will find this risotto is all the better when consumed by candlelight or firelight, and washed down with copious quantities of ice-cold Pinot Grigio. Well, that’s how my partner and I enjoyed the dish. 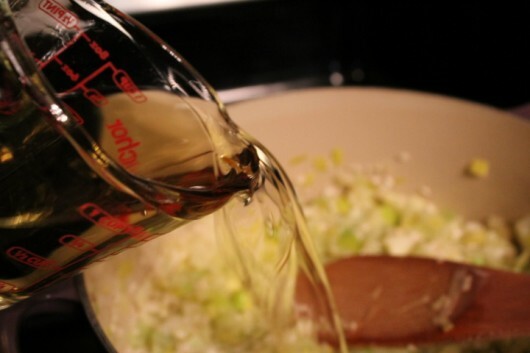 The fennel and leeks – In a heavy-bottomed, 5-quart pot, heat the butter and olive oil over a medium flame. 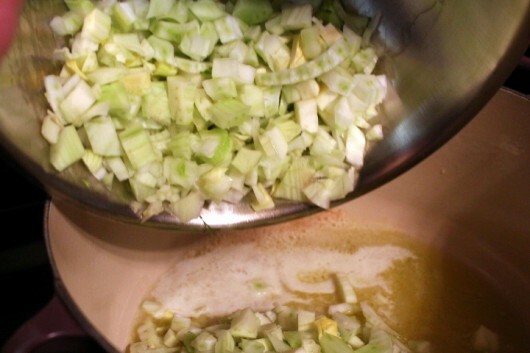 Add the fennel and leeks, and stir until soft — about 7 minutes. 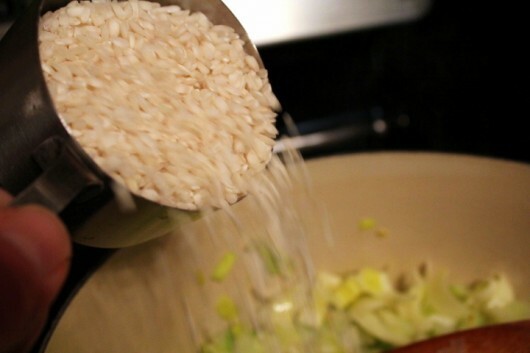 The rice – Add the rice, and stir it around until it becomes coated with the butter and olive oil — about 3 minutes. The coating will keep the individual grains from sticking to each other. 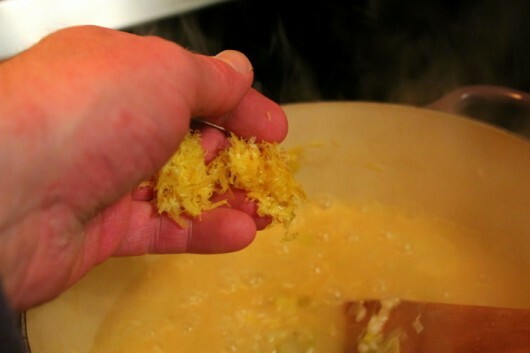 The wine – Add the wine, and stir constantly until it is absorbed by the rice — about 5 minutes. 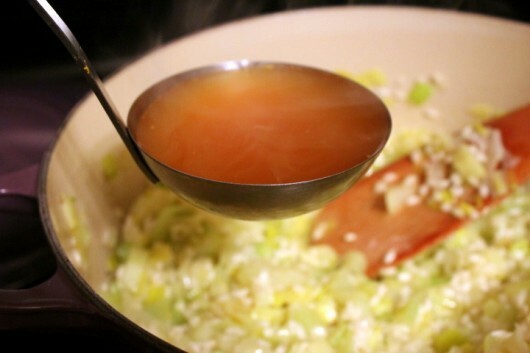 The chicken stock (or vegetable broth) – One or two ladles at a time, add the simmering stock or broth, and stir continuously. Wait until the liquid is absorbed before adding more. This step will take all of 25 minutes. Adding the peas, the lemon zest and the lemon juice – Gently stir in the peas, followed by the lemon zest and the lemon juice. 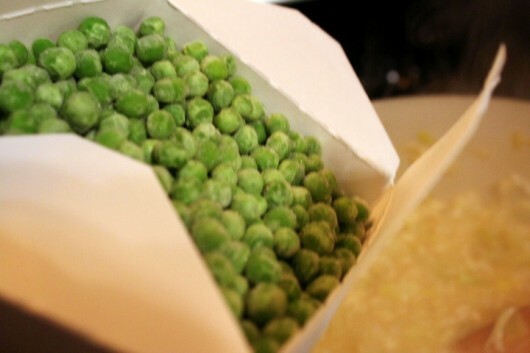 Stir until the peas have completed thawed and warmed – about 3 minutes. The cheese and seasonings – Off heat, add the cream cheese, and stir gently until it melts and coats the rice and vegetables. Then stir in the Parmesan or Romano cheese, and the salt and pepper. Taste carefully for seasonings, adding more salt or pepper as your taste indicates. 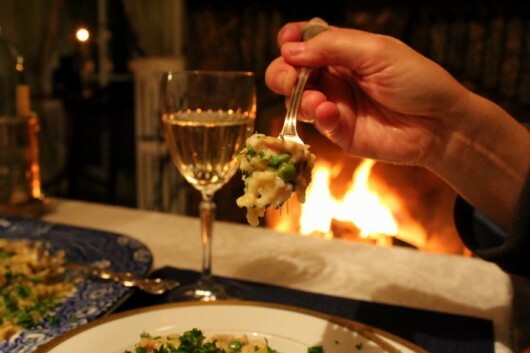 Serving – Pour the risotto on a platter, sprinkle it with the minced parsley, and serve while hot. Just finished the Risotto Prima Verde and it is the BEST risotto dish I have had in a very long time! Wow, Tessa! What an angel you are for trying this dish on the very day I posted the recipe. Thanks for the kind review! I have never been tempted to make risotto until this! Does sound heavenly. Thank you Kevin for sharing the recipe. Can’t wait to try! Hi Cary – Really easy to make, and sooooo scrumptious to eat. This looks delicious- and certainly sounds simple enough! I shall have to give it a try!!!! 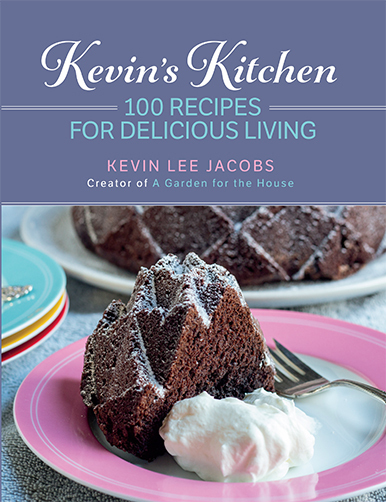 Hi Kevin do you ever usea pressure cooker for your Recipes? I would love to hear about them. Can you winter sow squash or watermelon? Hi Donna B – This is definitely an “oh-my-goodness”-type of meal! Brenda – If you try this risotto, I hope you’ll let me know how it turns out for you. Kathleen Hussey – In the distant past, I did own a pressure cooker. It received so little use that I finally gave it away. Consequently none of the recipes on this site require a pressure cooker. Regarding winter squash and watermelon, these seeds require such high heat to germinate that one really doesn’t benefit from winter-sowing them. I always direct sow them in late spring. Okay, I was dubious about the cream cheese….seemed like cheating. I made this last night and it turned out okay. 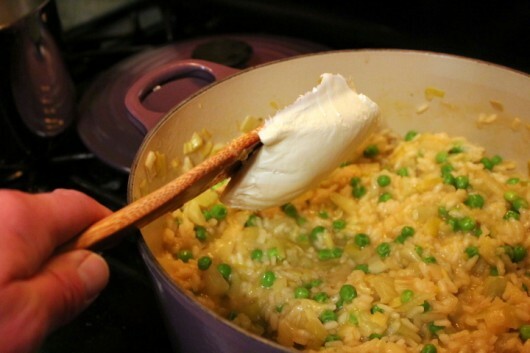 I’ve been making risotto for years and this recipe offered a bit of a twist with that cream cheese addition, which is why I decided to give it a go. Overall, I was disappointed with the flavor. The lemon gave a nice brightness but it overwhelmed the other flavors. 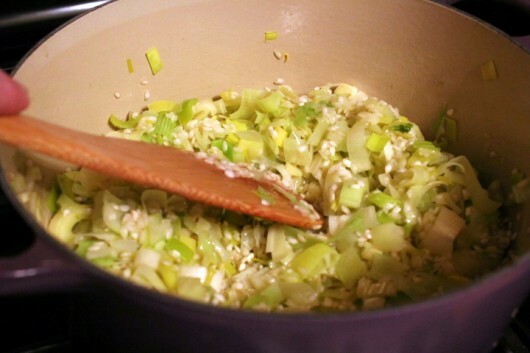 My first instinct was to sweat the fennel and leeks, remove them to make the risotto then add them back at the end. I wish I would have done this. I think the fennel and leek flavors were completely washed away with the lengthy cooking time needed to get the rice done; they also ended up being too soft and falling apart. 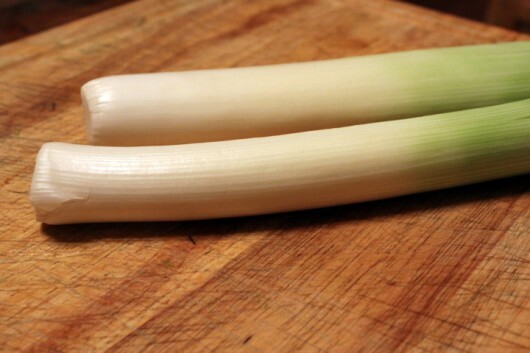 It is personal preference but I would have like to have bits of leek and fennel in my bite that still had a little firmness and some flavor. When my partner went for the sriracha sauce I knew this dish hadn’t hit the mark however, to put that into perspective, hot sauce of some form gets added to about 75% of whatever he eats – I’ve learned not to be offended! Having said all of this, Risotto Primavera is a super easy recipe for someone who has never worked with risotto before. I think succeeds better as a side with a meat (chicken) than a main. I would make this again but with the tweaks of removing the leeks and fennel then adding them back and eliminating the lemon juice, only using zest. I think anyone trying this will be rewarded with a successful risotto – thanks for sharing the recipe Kevin! 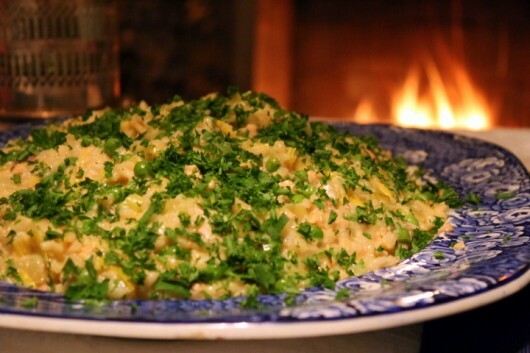 I hope that you are enjoying your vacation-I will be making this risotto tonight for dinner! Thanks you so much for the recipe! I want to try this! Thank you for the recipe! I will try this, but think I will take Constantine’s advice and sweat the fennel and leeks so they have some crunch. Have a great time on vacation. Plowing the snow here today! I can’t wait to try this recipe. What a fabulous recipe to usher in spring… Beautiful presentation as well.. Thanks for the inspiration Kevin. We are having vegetarian dinner guests in a couple of weeks. This will be a perfect dish to serve. Maybe I will also do a roasted chicken for those people who need meat in order to make it a meal. I love making risotto. It’s such a Zen thing…especially when I do it while drinking wine. Recipe sounds great, and I’ll try it; but I’ll do it in a pressure cooker, following Lorna Sass’s wonderful cookbooks. I’ve just come out of hospital (with all that means in food!) and this recipe and the picutres have inspired me. We will have this risotto tonight – thanks Kevin! Thank you for this recipe..Fabulous! 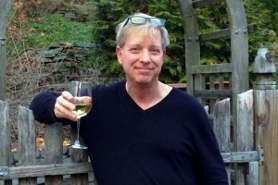 I do have questions tho’…..
recommend to substitute the wine with? suggestions for a ‘good quality’ olive oil? I have never cooked with fennel because I am afraid of the “licorice” flavor. Can someone tell me how apparent it is in this dish? Otherwise it sounds delicious and I would love to try a new risotto for a dinner party I am having later this week. 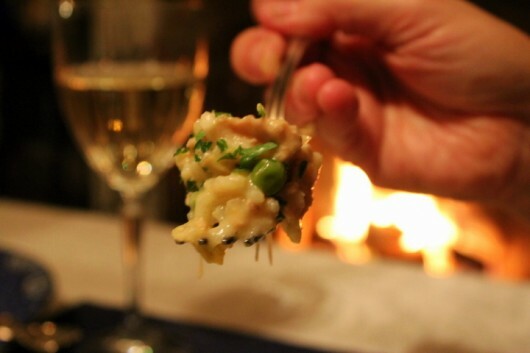 I so love me some Risotto! Might have to give this a whirl, although hubby doesn’t like licorice. I too, would like to know how apparent it is as I have never cooked with fennel. I used to make Risotto this traditional way, ie: stirring, cooking, stirring, cooking etc. Then I found (sad to say I did not create the technique myself) a recipe that lets you just combine all ingredients and pop it in the oven. Same results, less work. I can share it here if you like. I might give this recipe a try with my technique. It sounds so yummy! Lori & Deb – The anise (licorice) taste of fennel is not anise-y at all when cooked. Not to my taste-buds, anyway. It’s just a delicious, “green” taste. yummy ! Even with. substitutions. i did not have fennel or leeks handy so I substituted celery and onion and It was still over the top . thanks . I needed a “touch of spring”. hope your retreat to the sun was wonderful. Trudi Dido – So glad you tried this recipe. 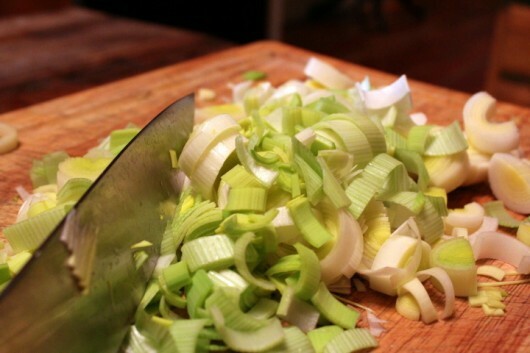 Your celery-and-onion variation sounds delicious!